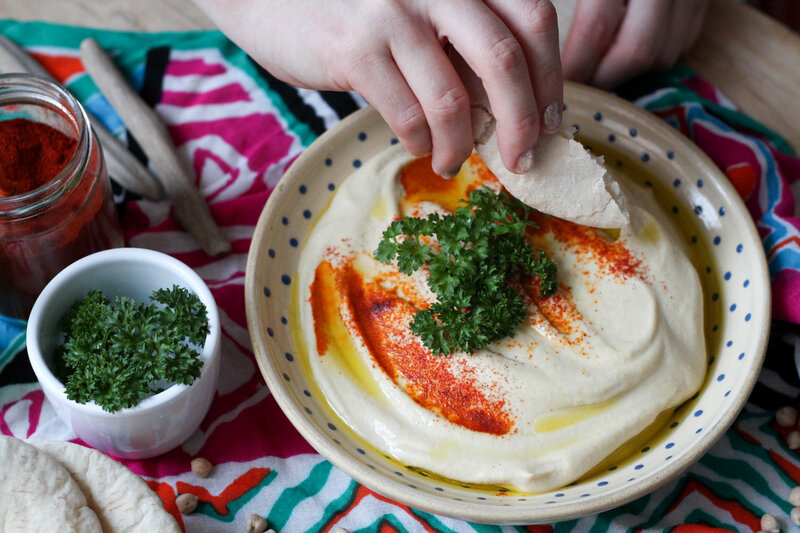 Like Eating Clouds: Hummus Tehina – Eat Me. Drink Me. But it won’t be in a few hours, it will be now, and I won’t care about consequences, just the gentle swipe of pita, the feel of satin in my mouth. Like eating clouds, said the friend of a friend who said Abu Hassan was the place to go. Tel Aviv was mostly shuttered when I arrived, my plane having landed just as the sun was setting and Shabbat beginning. The city was cooler than I expected it to be, a wind picking up off the sea and tickling beneath my light jacket. David and I walked through the market on our way to the beach – the Friday crowds had trashed the narrow street, and the vendors in their cleaning had thrown ripped cardboard boxes and mesh nets, rotting fruit and browning cabbage leaves into the center to later be swallowed by some Herculean cleaning beast. We picked our way through the debris, sallow hanging lights glinting off the stream of water trickling through the trash and across the dented blue metal of the sellers’ closed-up stands. 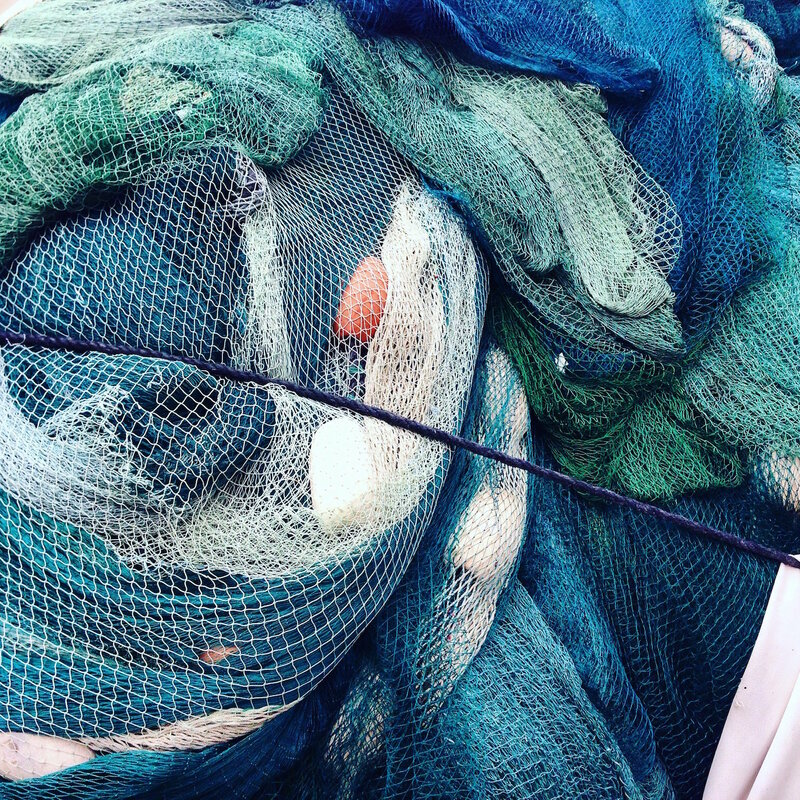 It felt as if we, too, were being funneled downslope with the trash, and it wasn’t until we sloughed out of the market that we felt we could breathe in, and when we got to the water, we exhaled. It was dark by now, the water stretching away into blackness, crawling at the sand with a steady shush. We walked along the shoreline, glancing up at the crisp-looking waterfront condos with bare white walls and bright white lights. 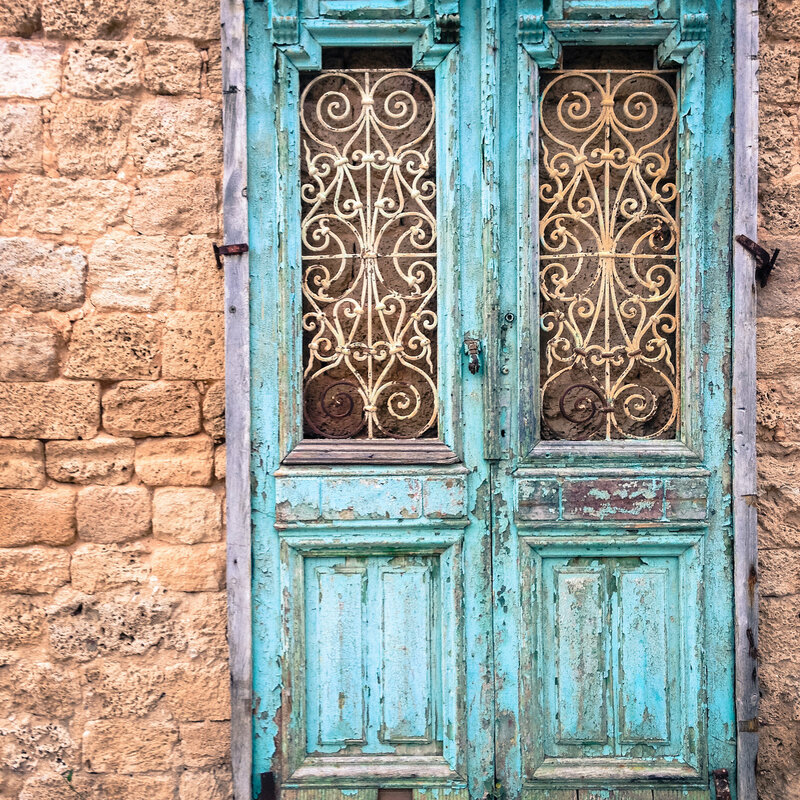 We veered right into the tangle of city looking for a place to eat, and it seemed as if the city swallowed us up in crumble and palm trees, crooked pylons and peeling paint, and on the next street chic stores with big glass windows and trimmed streets. We wandered into the neon glow of a falafel joint and ordered one to split. With deft hands, the man behind the fryer scooped up small, perfectly round balls with a crunchy breading fine as sand and stuffed them into a pita with spicy paste, garlicky tahini sauce, tomato, and lettuce. We filled our plates with salad from the bar – pickled peppers and cabbage slaw, onion, marinated eggplant, and beets, and outside, eased ourselves into utilitarian plastic chairs. It was a revelation of a falafel, a study in texture and taste, the lightness of those falafel balls balanced by eggplant dense with olive oil and its own soft flesh, perked up with pickle tang and soothed by a soft wave of tahini. It was in that moment I decided that I was going to like this city, whatever else it might yet show me, whatever complex histories it might yet unfurl. In the daylight, Tel Aviv seemed quiet, subdued. But it was still Shabbat, the city curled in on itself, with pockets of people clustered under restaurant heat lamps or drinking coffee in the warm light of the cafés. 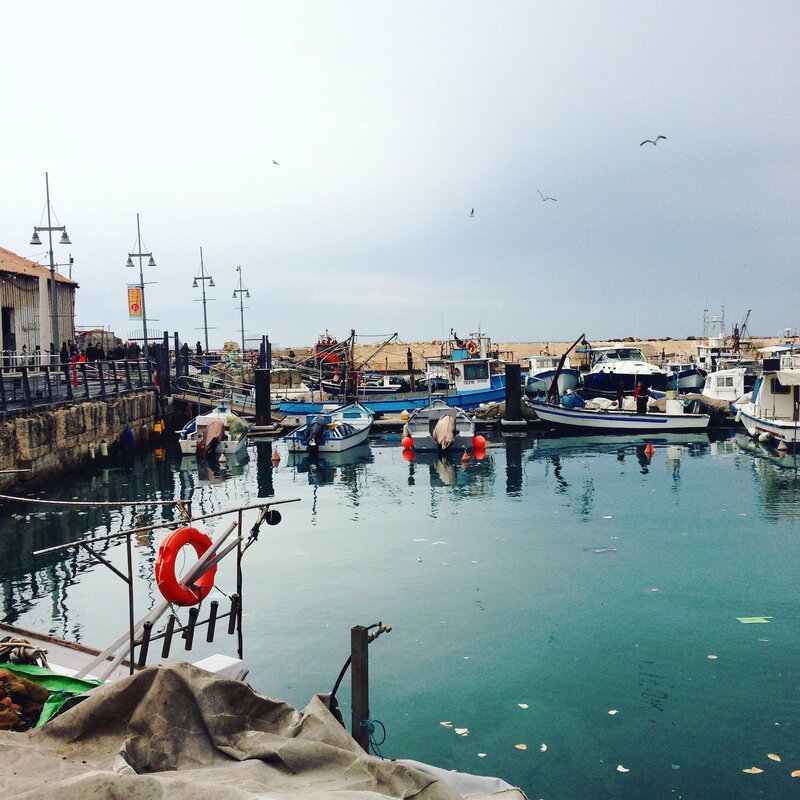 The day was gray and gusts of rain threatened to scatter, but in Jaffa, there were tourists already clambering up the old city amphitheater and strolling along the boardwalk. 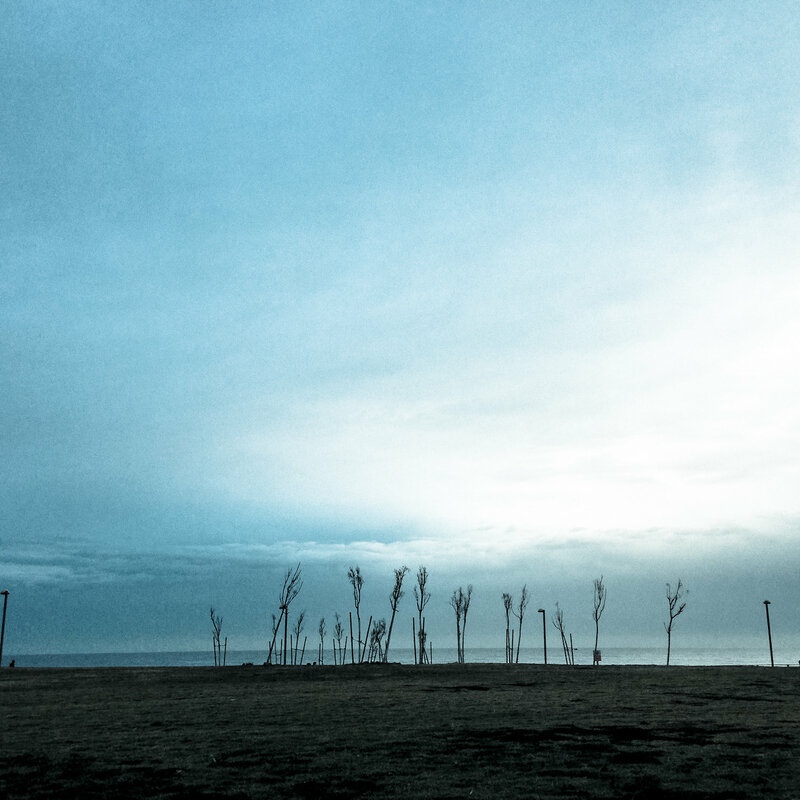 We leaned over the promenade a while to watch a man on the sand leading a horse around on a long rope, the two tirelessly circling each other until finally, he tied the horse up to a hitching post lapped in water and that was that. We walked for miles, twining through streets that seemed to fall in on themselves, and when we reached the Port of Jaffa, we sat down to rest, drinking a crisp beer and looking out over the fishing boats crabbed in the harbor, nets tangled in heaps, passersby cradling greasy bags of fresh French fries and fried seafood from a shack along the pier. I didn’t know it then, but the musabaha was just a few steps away, just the smallest of twists inland. It was waiting for me to discover it, just like it’s waiting for me now to return. 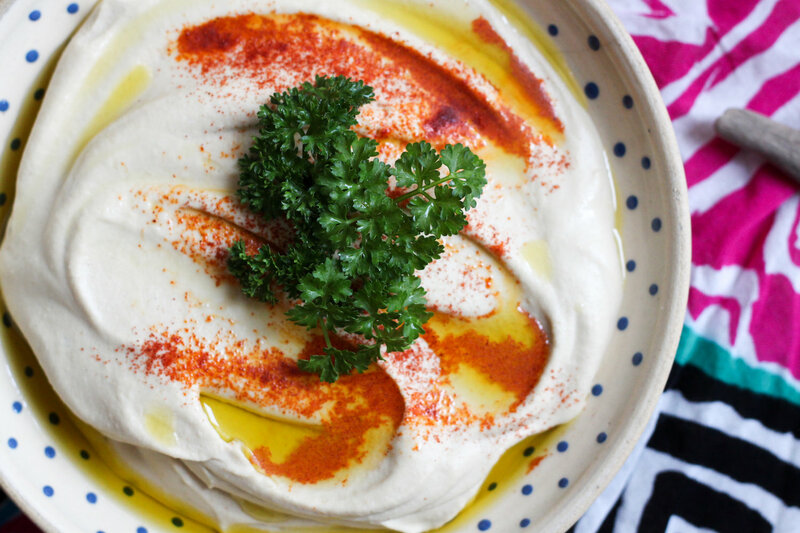 I struggled with hummus for a long time. Mine always turned out chunky and bitter – until I discovered two tricks: starting with a creamy, garlicky tahini sauce and leaving out the olive oil until the very end, when it’s simply drizzled overtop. 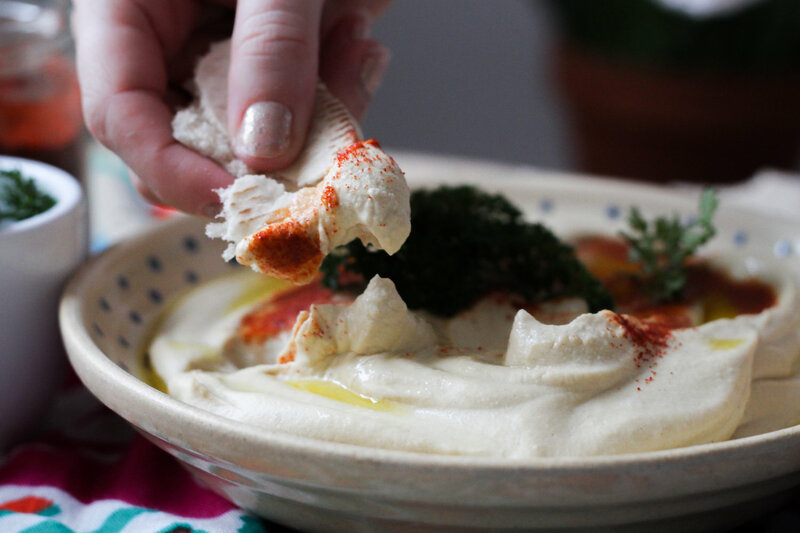 Cooking the chickpeas with baking soda is not necessary, but will help break down their pectic bonds, resulting in creamier hummus. 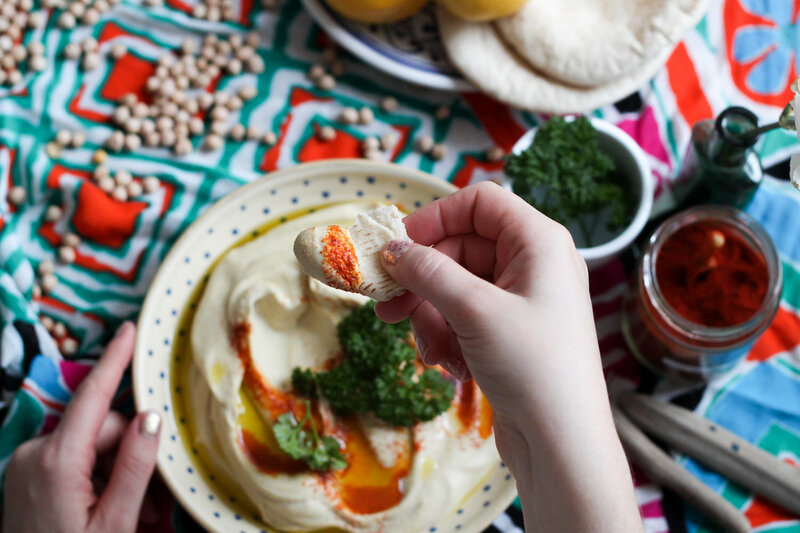 This recipe is adapted from Michael Solomonov’s recipe in Zahav. Makes 2 cups. Pour dried chickpeas into a bowl, and cover with at least 2 inches of cold water. Add ½ tsp. baking soda and soak overnight (or at least 8 hours). 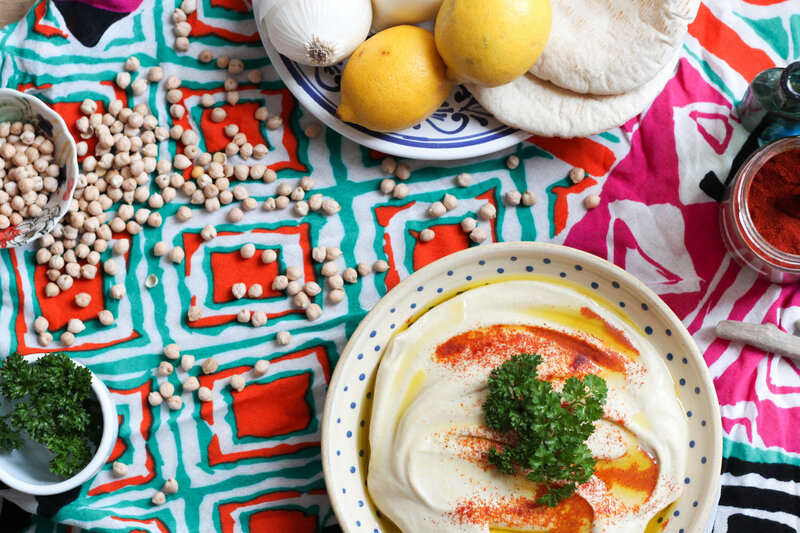 If it’s summertime and your kitchen is hot, soak the chickpeas in the fridge instead. Drain and rinse. In a medium pot, cover soaked chickpeas with at least 4 inches of water. Add remaining ½ tsp. baking soda and bring to a boil over high heat. Once the water is boiling, reduce heat to medium-high, and cook the chickpeas at a vigorous simmer until they are soft, about 1-1½ hours. If your water starts running low, just add a bit more. 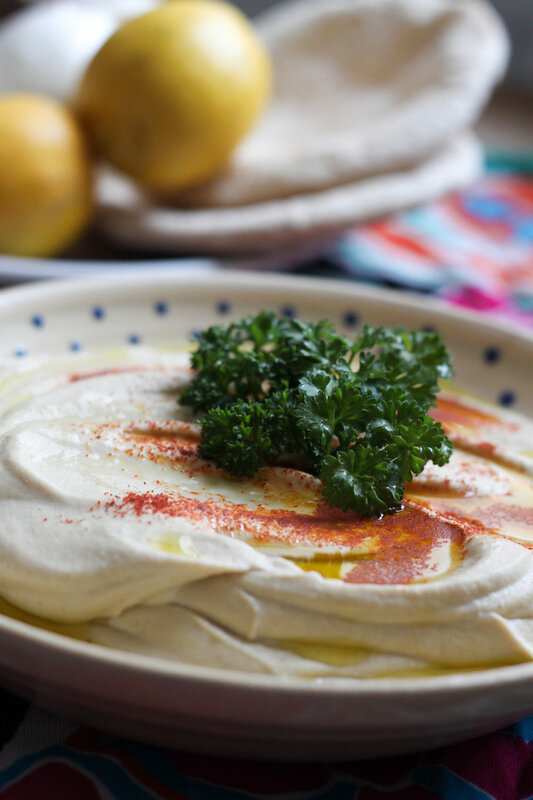 Don’t worry if the chickpeas start to break down – overcooked chickpeas will help your hummus turn out extra creamy. Drain, but do not rinse. 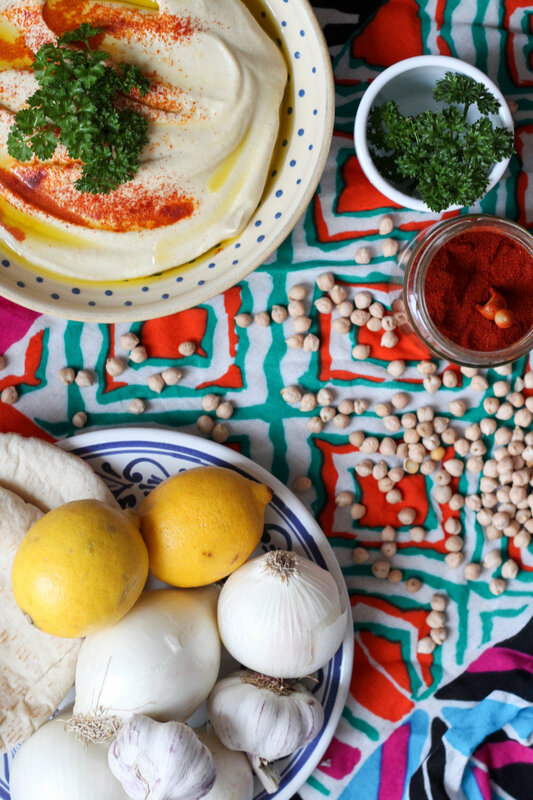 Make tahini sauce while the chickpeas are cooking. In a blender (or using an immersion blender), combine lemon juice, garlic, and ¼ tsp. salt. Let mixture sit for 10 minutes. Add tahini, remaining salt, and cumin. Blend until a thick paste forms. Add ice water while the blender is running, a little at a time, until the sauce is very smooth and creamy. 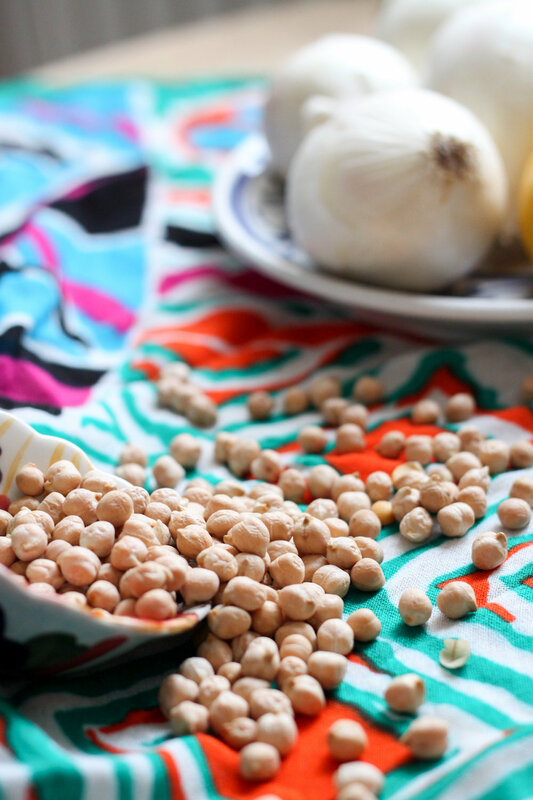 Add warm, drained chickpeas to the blender with the tahini mixture. Blend until very smooth and not at all grainy, occasionally scraping down the sides of the mixer. 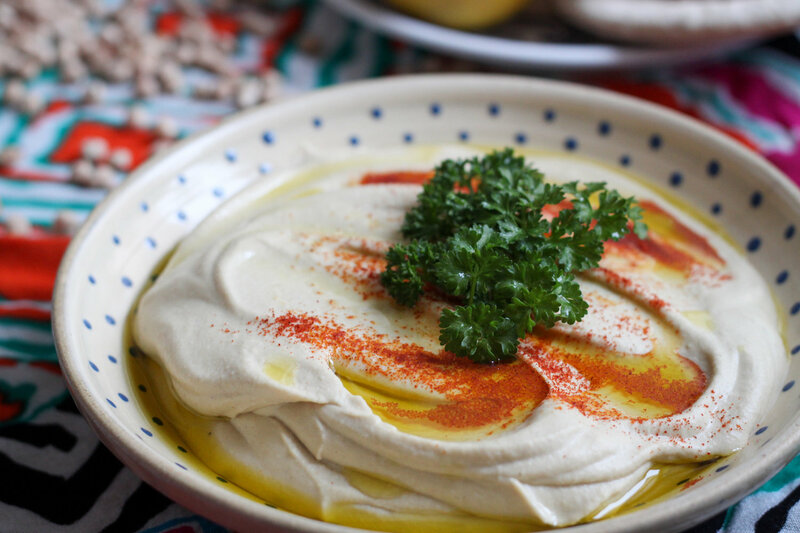 Don’t stop blending until your hummus is creamy and fluffy, adding a little bit of water if it starts to look too thick. You will probably need to blend for at least 2 minutes. 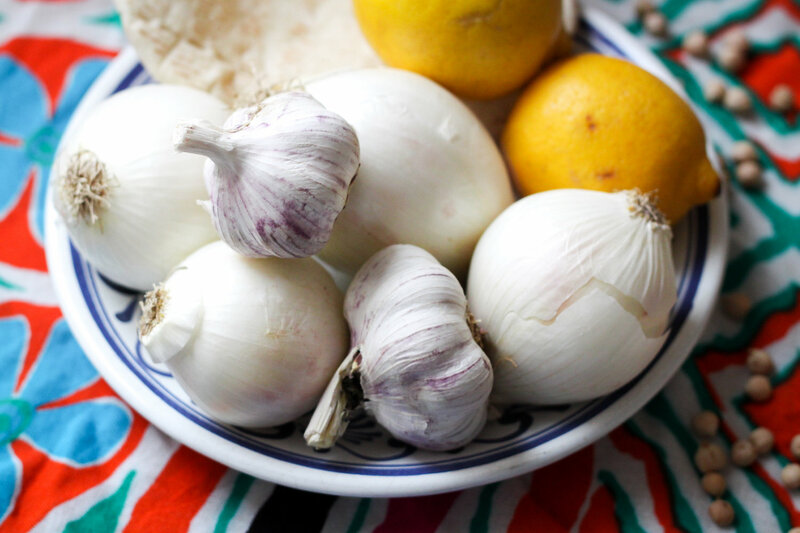 Season to taste with more salt, cumin, or lemon juice. 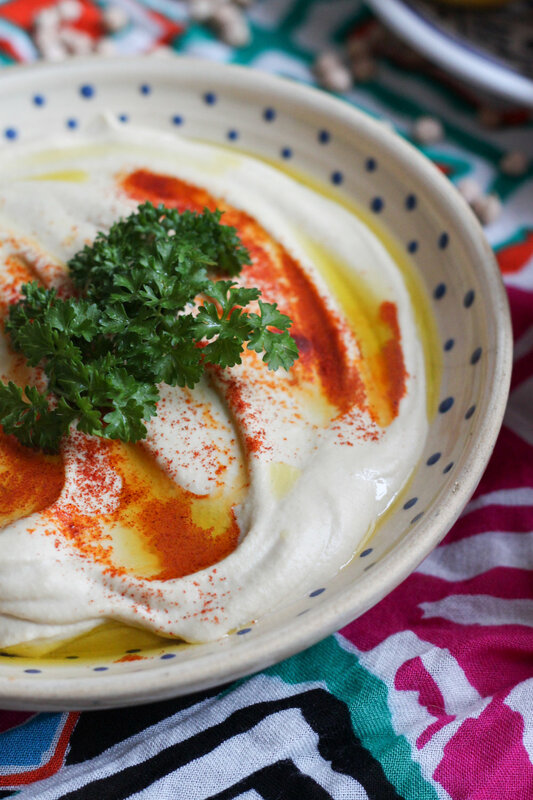 Serve hummus on a plate drizzled with olive oil and sprinkled with paprika and parsley. 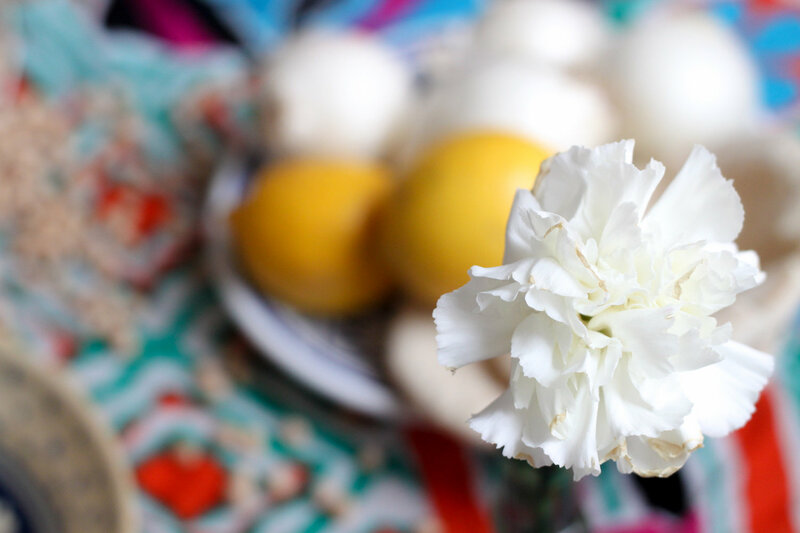 Eat with warm pitas and big chunks of sweet raw onion.